Whatever the occasion, the giving and receiving of chocolates is a gesture that touches us all. 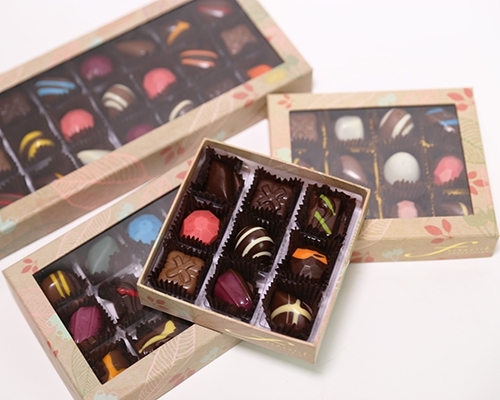 The most exciting of all is the surprising gift of chocolates, a luxurious gift box that never disappoints. Choose from our stunning collection of Chocolate Gift Boxes and find the right gift to enhance any occasion. In each piece you will discover an exquisitely smooth velvety chocolate taste. From our signature blend of Pure Couverture Milk and Dark Chocolate filled with crème ganache and truffle centres to our Chocolate Plato range, immerse your senses in superb taste sensations. Our Chocolate Plato range is made for the lovers of Milk , 55% or 72% Dark Chocolate filled with our special recipe of vanilla crème centre, irresistible to superb taste sensations.